Are you or your readers Doctor Who fans? Here's a chance to have them win a $50 gift certificate and special Doctor Who item. Sign up to participate and get a free Facebook, Twitter, or Pinterest link. Giveaway runs from November 15th to 29th. Come back to win, or if you sign up to participate, please tell them Java John Z's sent you. 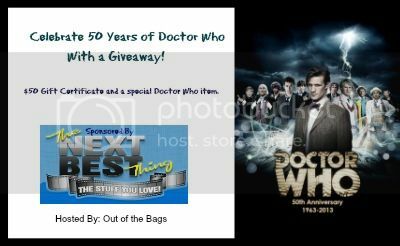 $50 Gift Certificate and Doctor Who item. Promote at least 3x times a week. Top Referer will receive a free Co-Host spot.